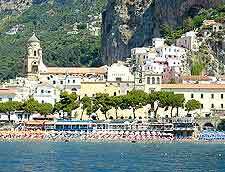 Although various art works are displayed around Amalfi, in cafes, gift shops, churches and in the old Arsenal on the waterfront, the art scene in the town is far from developed and those looking for public art galleries will have to look further afield. Naples is relatively close to Amalfi and at just over an hour away, its various art museums and galleries may well be of interest. 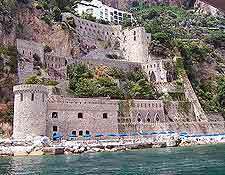 Day trippers from Amalfi will find that the palaces and fortresses of Naples house a wealth of historical art works. Of particular note, the Castel Nuovo Museo Civico on the Piazza Municipio, next to the port, comprises a wealth of beautiful frescoes from as far back as the 14th century. Also in Naples, the Museo Principe di Aragona Pignatelli Cortes on the Riviera di Chiaia contains an extensive collection of porcelain, while the Museo Nazionale di Capodimonte on the Via Miano has become known for its Renaissance-style paintings. Highlights here include Botticelli's 'Madonna' and Filippino Lippi's 'Annunciation'. For the very best in Italian modern art, the Palazzo delle Arti Napoli (PAN) in Naples is an impressive gallery and venue, spanning three floors and regularly offers changing exhibitions. More information about Naples Art Galleries.